There has been no print version of the Encyclopaedia Brittanica in seven years; and with the availability of technology in the classrooms, students no longer need to go to the school library/media center for research. interactive touch screens for their school lessons. And it’s no wonder. In addition to the walls being lined with traditional bookshelves filled with all genres of books, the modern furniture is definitely not the same as the students’ parents used when they were in school there, which Nipper showed pictures of during her presentation. The room itself is an open floor plan, but the furniture is divided into stations or spaces for a variety of designated purposes. New tall tables are popular with students for studying. 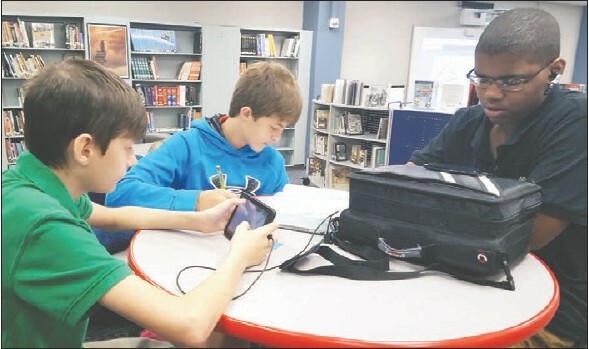 PCMS students using various media are, from left, Robert Huey, Carson Walker and Darrez Walker. “Tables and chairs instead of couches make a much better environment for learning,” Nipper noted. The large focal point is the interactive wall, on which a Smart board is flanked by two large touch screens. Multiple resources can be displayed at the same time, Nipper said. 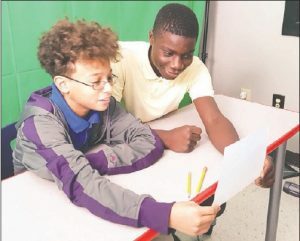 Teachers use the Smart board and interactive touch screens for differentiated instruction, providing students in the same classroom with different ways to acquire content and process the information and ideas. Students also use the screens. The Makerspace has stations for activities such as MakeyMakey invention kits, Legos, Origami and Cubelets robot stations. These activities rotate monthly and the stations are always open for students’ self-directed learning. 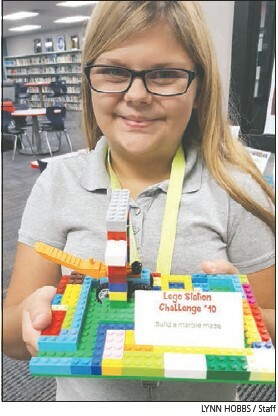 Emilia Dyer appears to beam with pride as she shows her completed Lego project recently. Pictures of the students’ Lego projects are posted on Twitter by Media Center Specialist Becky Nipper. “You wouldn’t think such a low-tech thing would be such a big hit with the kids, but this is,” Nipper said of the Lego station. She keeps it stocked with “challenge cards” of projects for the students to create, then she takes pictures of them with their finished projects and posts them on Twitter. “They love for their work to be shown,” she said. 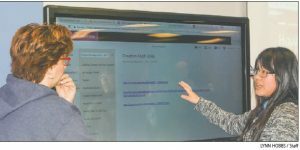 The collaboration/research station is popular with students who are working together on research, Nipper said, because they can display the work from each of their devices onto a main monitor seen by everyone in the group. Jacoby Reeves and Caesar Futch create a War Eagles News Network news show in the Learning Commons’ media room. The school’s War Eagles News Network weekly news show is made in the multimedia room, which has a green screen-curtain in addition to equipment and DVDs. The room also is used by students to create projects such as narrated slideshows, according to Nipper. Plans are in the works for an eBook station where students can use the school’s Kindle Fires and iPads to read eBooks. “This is not about a space I wanted. I have a house and I live there. 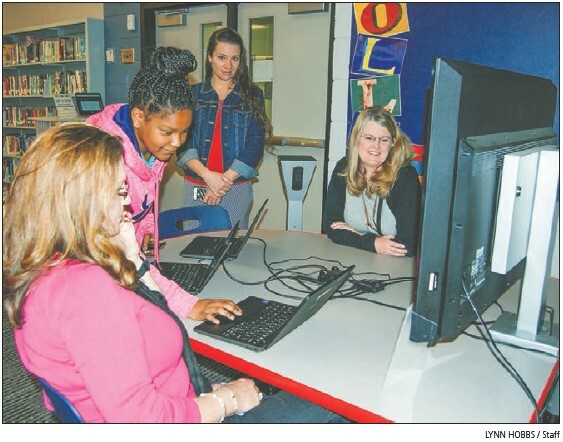 This is about engaging the kids in the learning process,” Nipper said. Nipper and several PCMS students made a presentation to the Putnam Board of Education in April, detailing why a Learning Commons would be beneficial to student learning. 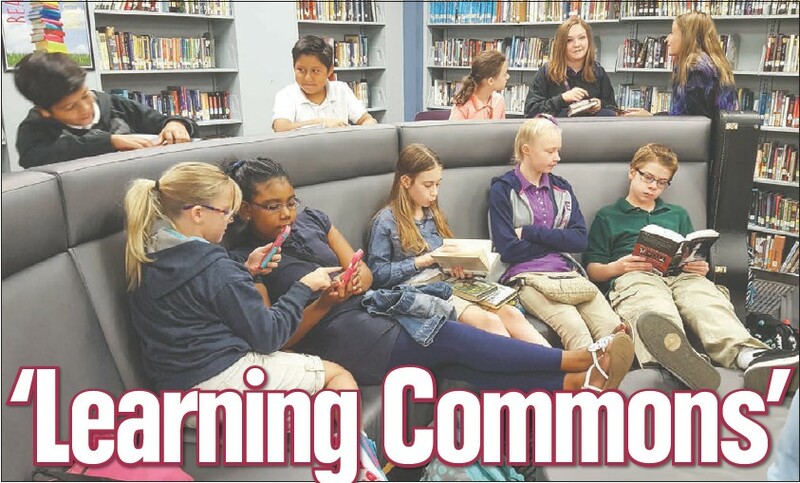 In a special called meeting May 9, the BOE approved spending $60,000 on the library’s upgrades. The Learning Commons opened to the students in August. Julie Hayes of Oconee County, Aggie Johnson of Jones County and Julie Payne of Oconee County. At the open house, media center specialists from Forsyth, Monroe, Oconee, Jones, Baldwin, Bibb, Pike, Taylor and Rockdale counties asked quite a few questions and a few commented how fortunate Nipper was to have “so much support” from her administrators and BOE members. The visitors obviously were interested in the various stations; and they also asked questions about day-to-day activities and schedules, and where Nipper gets money for projects (over-due fines, she said).